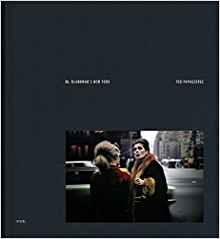 Tod Papageorge moved to New York in his mid-twenties and his friends Gerry Winogrand and Joel Meyerowitz suggested taking street photos as a possible entrance to getting commercial work. The sixty-one images in the book show his budding potential. He had a fondness for windows, especially shop ones, the book's title is from the name of an optometrist's shop next door to a florist, shown on the title spread. I think these window photos are the strongest in the book, they have a natural framing especially when taken head on which doesn’t allow for any distortion and the viewer can appreciate the objects within the frame. The photos are all in color and printed on an excellent matt art with a 175 screen and unusually for a photo book these days with the images only on the right-hand page. The book’s size, eleven by twelve inches, also makes looking through it a pleasure.